Superman shows up in Gotham, meets with Commissioner Gordon about Batman being missing. Batman is being held by Brainiac on New Krypton. Superman cleans up Gotham, taking care of the Bat villains. The Riddler gives Superman a clue as to who may have kidnapped Batman. On Paradise Island, Wonder Woman and her mother discuss Brainiac and Batman's abduction. Wonder Woman heads to New Krypton. On New Krypton, Superman meets up with Jor-El and a pregnant Lara. They discuss Brainiac's capture of Batman. Superman arrives at Brainiac's lair and free's Batman while fighting Brainiac. Wonder Woman arrives to help Superman take on Brainiac. Batman uploads a Kryptonite virus through an email to Brainiac, defeating him. Alfred arrives to take Batman home in a Bat-Spaceship. Meanwhile on Earth it is revealed that Lex Luthor is the one who infected Brainiac causing him to abduct Batman. He talks to a mysterious cloud about their plans to kidnap Lara and Jor-El's unborn child. Story - 5: This was a hard book for me to review and grade. As I am not the target audience for it. It is essentially a children's book. And I not being a father... yet, it left me a little confused. I had to imagine reading this to my niece and nephew to really understand the clever writing at capturing a child's imagination with these iconic characters. Well done to the creative team. There are some amazing plot elements that doesn't dumb down for its target audience. I like the Sci-Fi elements that have been borrowed from the World of New Krypton story-line from the main Superman books pre-New 52. Also interesting to see that Jor-El and Lara are still alive and expecting a child. Good little book for the young ones and parents alike. Art - 5: Obviously the art is very simple, which fits the narrative. The simple style makes it easy for the target audience to see what is happening, and more importantly, be simple enough for children to try and copy. Its what I used to do as a kid. I like the return of Jor-El's Silver-Age green and red suit. Also the use of the Man of Steel style "S" shield. I'm always a fan of Batman's yellow oval symbol also. 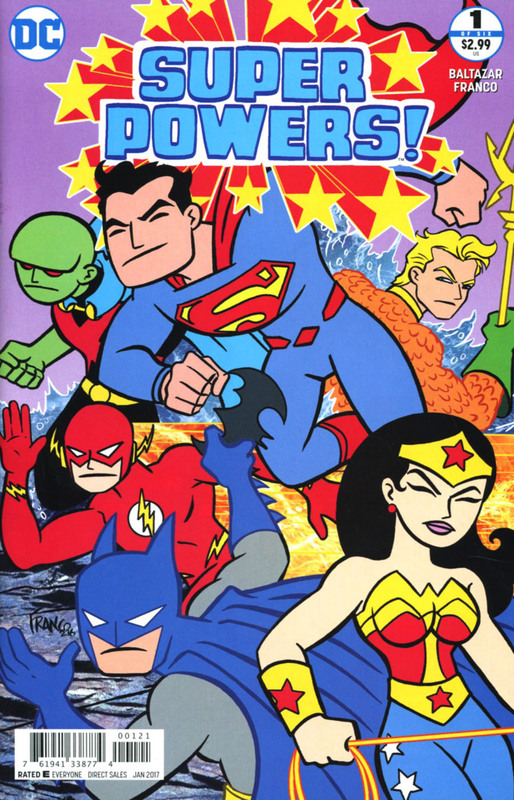 I grew up on the original Super Powers era. So this is a nice nod to that. Cover Art - 5: The main cover is good. 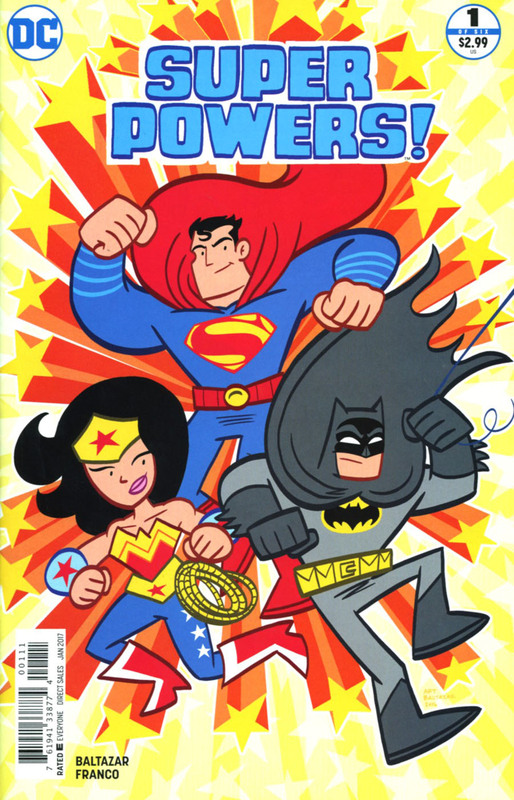 Features the trinity very prominently, however I like the variant cover by Franco a whole lot better. The style is still simple, but they have the traditional Super Powers feel to it. The only member missing is Green Lantern from the Magnificent Seven Justice League members.